And more legs, teh legs and back portion of P90X. gotta love the over 11 lunge movements and the ridiculously hard lat pulldowns :) leaving the user beyond death, i gotta start eating right though if i wanna see results faster :P NTS: start bringing snacks to school! Ugh, time for the good old fashion functional olypic lifting , lots of power cleans ,and explosion excersizes for my legs, but the weight, is slowly getting lighter, poer cleaning 150lbsx5 felt like almost nothing, til i upped the weight to 185 and near fell over :$. 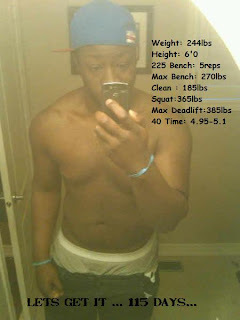 My time got cut short though, my school teachers are stingy about weighroom time, S.O.Bs ! Day 3, look at those arms! Hard work overcomes raw talent. Its been nearly a year bloggers! whaddup? im starting on this again just because and my new motive currently is to trim down and gain speed for football in 2010. i have one last shot at getting looked at by university scouts and im doing everything i can .I'm signing up to SST in about a week, i have P90X for those morning workouts and im going to do weight testing at premier fitness with my other friends just so i keep in check . Why am i blogging this ? its because i want to keep track of my 115 day journey to achieve my goals, yeah its kinda played out to do so but in september i want to look back and just say "Damn, i came a long way". 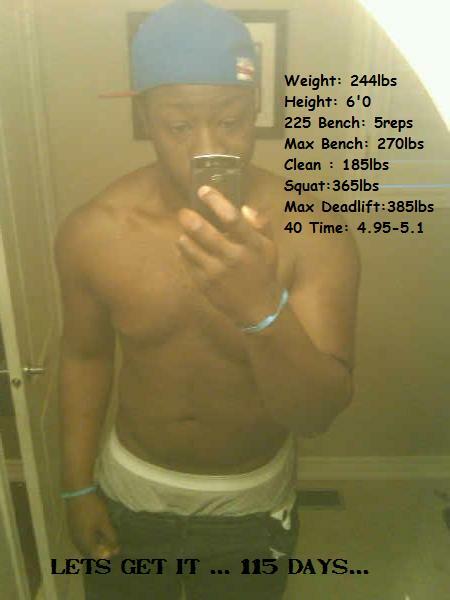 This is where i want to be, and i have 4 months to get there :) let it begin; the road to BeastMode!